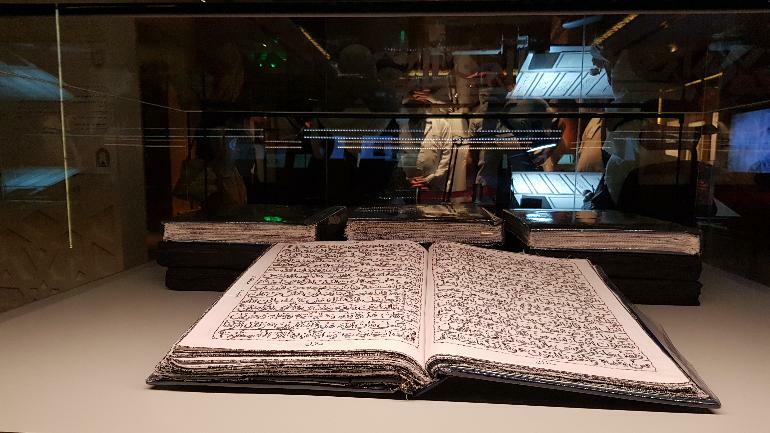 The creator of the Quran which is being displayed at The Holy Quran Exhibition in Medina took 32 years to make it. A woman from Pakistan, Naseem Akhtar, has produced a creative Quran. The religious text of Islam was written by Akhtar using needles and threads as reported by India Today. Akhtar hails from Gujarat in Pakistan. She was 30 years old when when she took up the production of this novel Quran. She completed the Quran in January, 2019. It took her 32 years to make this magnificent copy of Quran. Naseem Akhtar, for the first 15 years, spent her days writing the Quran on pieces of White Irish fabric by hand. Another 17 years were then spent to create these words using needles and black thread. Around 300 metres of cloth and close to 25,000 metres of thread were used to create the Quran. The compilation consists of 10 bindings; each contains three paragraphs of Quran. These 10 bindings weigh 55 kilograms. The Quran created by Naseem Akhtar using needles and thread is put out for display at The Holy Quran Exhibition in Medina, Saudi Arabia (Kingdom of Saudi Arabia: KSA).